A test sketch of an alternative background for the painting Max n Cookie. Chinese Crested dog Max wears a protective t-shirt and gazes away from the turtle named Cookie. 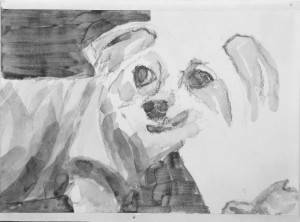 A high contrast black and white acrylic study made for a commissioned portrait by Elizabeth Lisa Petrulis.